Congratulations! You’re finally preparing to purchase your first automobile. Whether you fancy a sporty sedan, a capable SUV, or any other type of vehicle, there’s nothing quite as exciting as heading down the road at the helm of a fresh ride. Now, you’re ready to begin your purchasing procedures. And to help you make the most of your car-buying journey, we’re here with this Steps to Financing Your First Car eBook. On top of these helpful tips and tricks, this FREE eBook comes packed with a collection of handy coupons that are ready for your next trip to the dealership. That way, you can save some cash when it’s time for you to purchase your new vehicle. 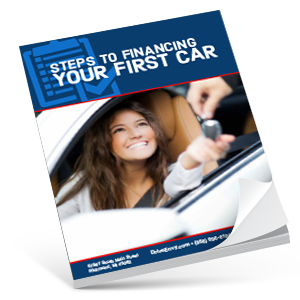 Why wait to take advantage of all the perks included in this Steps to Financing Your First Car eBook? Instead, download your copy by clicking on the link and browsing through the pages today! Before long, you’ll be suited up with all the information you need to choose the financing option that’s best for your lifestyle.